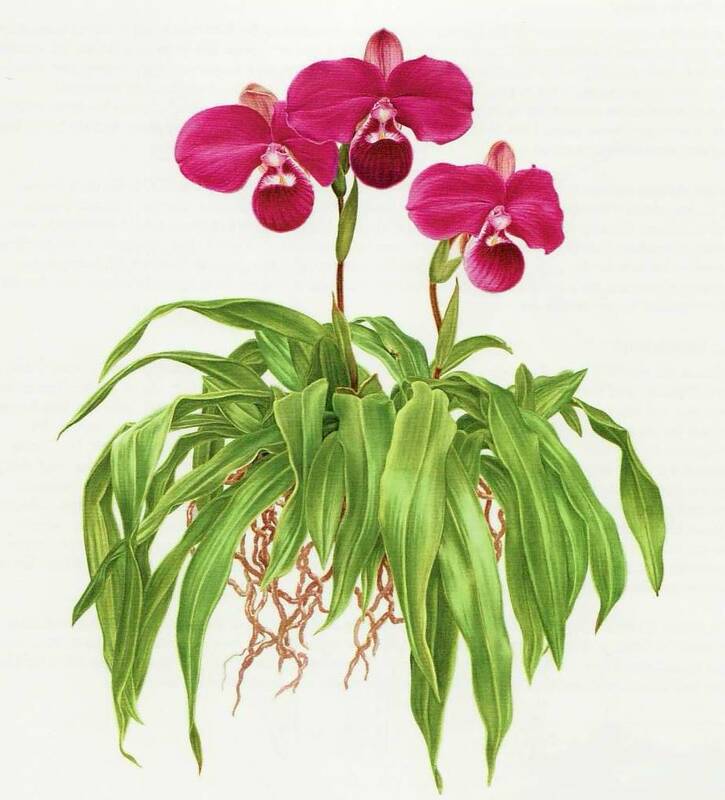 The discovery of Phragmipedium kovachii set the botanical world alight and may be the most important orchid find in the past one hundred years. Its large size and brilliant color led many to wonder how it had remained so long secreted in the Peruvian jungle. Although reported to have been discovered in 2001 by a local farmer in northeastern Peru, it was brought to the public’s attention in mid-2002. In 2003, the Peruvian government, through its Department of Natural Resources authorized two established Peruvian plant nurseries to obtain five Phragmipdium kovachii from the wild for a captive breeding program. I first painted Phragmipediu kovachii in 2003. In May of that year, I traveled to Peru and joined a small group of Peruvians and Americans interested in seeing and studying the plant in its habitat. It was an experience I shall never forget! We embarked on a rough and treacherous trail. We were ill-prepared for what lay ahead. I decided to stay behind with a few other people. The others continued onward. A few days later, I was able to sketch and study one of the legally collected plants. Alfredo Manrique Sipan was kind enough to invite me to visit his nursery in Lima in late 2004, and there I started the painting exhibited here. I made many color studies and sketches from life, then completed the painting back in Brooklyn.